On Saturday, March 26th, the English Graduate Program hosted its Second Annual Student and Alumni Symposium, centered on the theme of Change as inspired by the Cultural and Intellectual Community Program Council (CICPC) annual theme. This event continued last year’s establishment of a forum for current MA students to come together with alumni of the program to share and participate with each other’s works and accomplishments in an atmosphere of academic achievement and community. 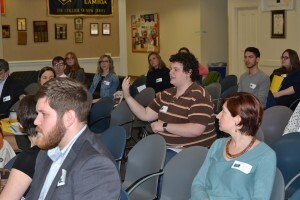 Each carefully planned panel showcased the individual and collaborative research and writing undertaken by the TCNJ English Graduate community. The impressive works presented ranged from papers born in our program’s seminars, the culmination of master’s thesis projects, and independent efforts in professional development and creative writing. Overall, ten current students and their works were heard throughout the day’s presentations, with six notable alumni returning to feature their continued, new, or returning scholarly and creative works. 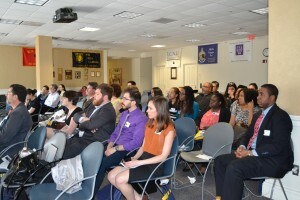 They were joined by over forty-five fellow students, alumni, faculty, family, and guests in attendance. The symposium celebrated a dynamic and thriving community of students and alumni within the Graduate English Program who are actively teaching, publishing, and continuing academic pursuits beyond the college seminar experience through exciting, transformative avenues. This year’s symposium, coordinated by Dr. Lisa Ortiz-Vilarelle, Lindsay D. Rogers, and Matt Fuhrmeister, featured four panels united by the broader theme of Change, as well as original poetry readings, an interactive Lightning Round, a keynote address by distinguished 5-Year MA alumna Erika Shultes (’14), and the presentation of two master’s thesis projects. The event’s first panel, titled “Change in Convention and Form: Breaking the Limits of Life Writing,” featured current students Sara Ashley Stammer, Allison Greer, and Matt Fuhrmeister presenting scholarly papers showcasing the limitless power life writing has over convention and form. The second panel featured the symposium’s theme as “Change as Pedagogy Re-Examined.” Alumna panelist Melanie Frances and student panelist Lindsay D. Rogers positioned ‘teaching change’ as the primary goal, with their two papers tracing how postmemory and narrative are taught and can be used in fostering global consciousness, and how pedagogical impulses can be directed towards liberating education as a site of cultural and social contention. The third panel entitled “Change as Binary Inversions” featured three alumna panelists, Ashley Vogt, Shaun Byron Fitzpatrick, and Lauren Makrancy, who presented works questioning “What happens to a binary when it becomes so complicated and inverted that it ceases to showcase two clear opposing forces?” Their papers aimed to dismantle such a simplified notion of binary, whether that is black vs. white, colonized vs. colonizer, or destruction vs. creation, respectively, paying particular attention to how language is used in complicating these apparent opposites. The fourth and final panel of the day featured current MA students Robyn Gold, Alexander Maresco, and Angela Hontau presenting works focused on “Change in Monstrous Fantasies and Bodily Transformations.” Exploring narrative transformation, sexual politics operating in fantasy, and philosophical interpretations that find godliness in monstrosity, these papers offered revisionist and often resistant readings of their focused texts, and opened the works to transformative applications of narratologic scholarship, gendered and feminist critique, and Aristotelian conventions. Also featured during the symposium was an interactive Lightning Round questioning “Change and the Digitized Self-Narrative: Is Social Media the New Autobiography?” Led by current MA students Nicole Dittmer, Ryan Gerber, and moderated by Matt Fuhrmeister, the panelists and audience alike were afforded the opportunity to examine the determination of an authentic autobiographical representation through transitions of physical to digital life-writing in social media such as Facebook and blogging. The construction and interpretation of identity though social media was debated and questioned throughout the dynamic conversation, a lively opportunity for attendants to ‘talk back’ to the scholarly work undertaken by the panelists. The audience responds during the Lighting Round discussion. Attendees were also treated to featured readings of original poetry by current MA student Allison Greer and alumnus Corey Drake, projects began as independent creative efforts and during Professor Catie Rosemurgy’s undergraduate Poetry Workshop, respectively, and developed throughout both poet’s time in the Graduate Program. Current MA students Cara (MacNeil) Donoghue and Lindsay D. Rogers also took the opportunity afforded within the gathering of the Graduate community to present the culminations of their work towards their master’s theses. Donoghue’s “Gender Fluidity and Performing Control in the Henriad” demonstrated a transformative application of feminist Marxism to Shakespeare’s tetralogy, and looked forward to new frameworks applying gendered performance in analyzing success within a system. Rogers’s “Exile Literature and Technologies of the Search for Home” established a reevaluation of canonical texts through negotiating the simultaneous appreciation and marginalization of diverse writers, ultimately calling for a change in consideration of genre assignment as demonstrated through exile literature examined as an experience of consciousness rather than geography. Finally, the symposium was united on its theme of Change in a keynote address from alumna Erika Shultes, who urged attendees to embrace “change” as a vital aspect of academic, social, cultural, and personal development. Speaking of her experiences abroad as a Fulbright English Teaching Assistant in Suceava, Romania, and tempered with her own experiences as a second-generation American, Erika’s remarks on the necessity of embracing and pursuing transformative experiences and developing a consciousness of the changing world provided the symposium with an essential reflection on Change. The audience watches the MA thesis presentations. 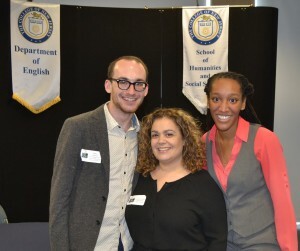 This year’s symposium would not have been possible without the support of The Office of the Dean of Humanities and Social Sciences, The Department of English, including Program Assistant Michelle Ordini and Department Secretary Rosa Rodriguez, and The Women’s and Gender Studies Graduate Certificate Program as well as the participation of the distinguished graduate students, faculty, and alumni. The English Graduate Program is excited to celebrate scholarly work in future symposiums and make this event a tradition within The College and The Department of English, and looks forward to next year’s Third Annual TCNJ Graduate English Symposium: Sustainability, Space, and Place.